Comments: Hands down, the vintage Luke Skywalker (Jedi Knight Outfit) action figure had it going on. Not only was the sculpt dead on, the contemporaneous Jedi came with not one, not two, but three stupid-cool accessories, thus making it the quintessential Luke Skywalker figure in the vintage line. 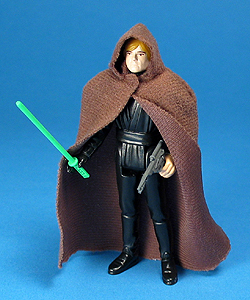 Major Variations: Though all vintage figures have minor variations, the Luke Skywalker (Jedi Knight Outfit) action figure is loaded with virtually every type of major variation imaginable. Not only was it produced with noticeably different sculpts; it was also available with countless accessory variations/ combinations, making it one extraordinary example for a collector with a necessity for variations to focus on. There were two main body sculpts used in the production of this figure, each seemingly originating from different countries, though not proven to be exclusively so, that at a quick glance look identical. Nonetheless, each has its own characteristics that separate them form one another. One version, produced in [originally] Hong Kong, is a touch shorter and sports a slightly more defined sculpt. It is easiest to spot by the shirt (under the Jedi tunic), which sports two protruding horizontal lines to make the front part that is later flipped down in the film. The second sculpt [originally] produced in Taiwan, is noticeably taller when standing beside the first version, and sports a single line on the shirt where the other has two. This figure was produced with heads moulded in flesh-toned plastic with painted hair as well as heads moulded in light brown (the hair colour) with the face painted on. Since this was one of the many figures produced with the removable style head that Kenner favoured using in most post Star Wars figures, it is absolutely impossible to say that either version of the head was produced exclusively for one body type. Though quantities may vary from one region to the next, it is popular belief that the flesh-tone moulded head is the rarer of the two. Earlier versions of this figure were produced with Blue Lightsabers, but Kenner was quick to correct the colour (and inadvertently create the only vintage Luke figure with the right blade colour). The Green Lightsaber was packed in with every card back variation after its insertion on the later Return Of The Jedi 65 back cards. Though not shown, there are three known Lightsaber sculpts. Two of them were released domestically, but the third has only shown up with Lili Ledy figures. Click here to see a comparison of all three sculpts. To date there has been no documentation of the blue Lili Ledy version being released in blue. It is extremely important to keep in mind the vast quantities of reproduction Lightsabers. In the photo comparison of the authentic and repro Lightsabers, examine the portion where the hilt meets the blade. Kenner has never produced this style of Lightsaber (in any colour) with this portion rounded as found in almost all known reproductions. Though the vast majority of this accessory was moulded in gray plastic, there were many produced in brown/ gray plastic. 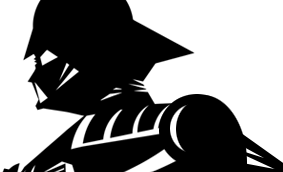 It is commonly accepted that the latter version was available primarily in Europe. The cape was produced both with and without a snap. It is popularly believed that the version with the snap was the first produced, and likely due to cost restraints was replaced with the sewn-shut version. Though both versions were available with the earlier produced Blue Lightsaber, very few carded figures with the Green Lightsaber have been documented with the Snap Cape. Because of all of these different components, it is possible that there were over twenty versions available... and these are only the major variations.